There are several ways to start AddH, a tool in the Structure Editing category (including using it via Dock Prep). AddH is also implemented as the command addh. 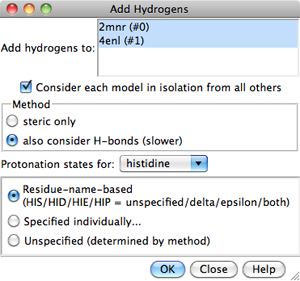 Models to which hydrogens should be added can be chosen from the list with the left mouse button. Ctrl-click toggles the status of an individual model. To choose a block of models without dragging, click on the first (or last) and then Shift-click on the last (or first) in the desired block. Consider each model in isolation from all others - whether hydrogen placement should be affected by atoms within the same model only. Otherwise, other models in the vicinity (except submodels of the same model) may affect hydrogen placement, regardless of whether they were chosen for hydrogen addition. also consider H-bonds (slower) (default) - based on atom types, clash avoidance, and hydrogen bond formation. Considering H-bonds increases calculation time, and the method is still under development. Although hydrogens are placed to avoid clashes and form hydrogen bonds where possible, they are not energy-minimized, and a globally optimal network in terms of the number of H-bonds or total H-bonding energy is not necessarily found. Residue-name-based (default) - residue names will be used to determine which histidine sidechain nitrogens should be protonated: the δ-nitrogen in residues named HID, the ε-nitrogen in HIE, and both nitrogens in HIP. Residues named HIS will be treated as unspecified, and may end up with either or both sidechain nitrogens protonated, depending on the method and the local environment. Unspecified (determined by method) - regardless of which of the names above are used for histidine residues, all will be treated as unspecified, and may end up with either or both sidechain nitrogens protonated, depending on the method and the local environment. Clicking OK initiates hydrogen addition and dismisses the dialog, while Close merely dismisses the dialog. Help opens this manual page in a browser window. If any atoms cannot be assigned a type, another dialog will appear. It is necessary to click on the line for each unassigned atom and then indicate its proper substituent geometry and number of substituents. Added hydrogens are colored the element color (default white) if the attached atom is colored by element, otherwise the same as the attached atom. The default VDW radii of carbon, nitrogen, oxygen, and sulfur atoms depend on whether hydrogen atoms are present. Therefore, the radii of some atoms will change when hydrogens are added. Potentially ambiguous or rare (shifted-pKa) protonation states, especially in binding sites and nonstandard residues, should be verified and corrected as needed. For example, extra hydrogens can be deleted, and atom types can be edited (before hydrogen addition) with setattr or Build Structure. Residues at the ends of connected peptide chains are inspected to determine whether they are real termini, based on any SEQRES information in the input PDB file (or the mmCIF equivalent) and the presence or absence of additional chains with the same IDs. Real N-termini are assumed to be positively charged (+H3N–) and real C-termini are assumed to be negatively charged (–CO2–). If a C-terminal carboxylate is missing an oxygen (OXT), it will be added. End residues that are not real termini are terminated like other chain-internal residues, with N(H)– and –C(=O). The position of the N-end “amide” hydrogen in such cases is not fully determined by the positions of the existing atoms; AddH places this hydrogen to produce a φ angle equal to that of the subsequent residue. Bond lengths to other X are approximate, obtained by adding the covalent bond radii of element X and H.
When a more intensive approach is desired, the program Reduce (developed by the Richardson Laboratory) is a good alternative. Reduce places hydrogens to optimize local H-bonding networks and avoid steric overlaps, while flipping certain sidechains 180 degrees as deemed appropriate to fulfill these criteria. Asparagine and glutamine sidechains may be flipped to switch their terminal N and O atoms, and the imidazole ring of histidine may be flipped to switch N and C identities. The protonation state of histidine is adjusted based on the local environment. Asparagine and glutamine: using hydrogen atom contacts in the choice of side-chain amide orientation. Word JM, Lovell SC, Richardson JS, Richardson DC. J Mol Biol. 1999 Jan 29;285(4):1735-47.